Economic segregation, driven by metropolitan development patterns reinforced by local institutional boundaries, is a significant force driving rising economic inequality and worsening its effects. Directed by a complex web of private practices and public policies, not free choice in the marketplace, excessive economic segregation violates fundamental American values of fairness and equal opportunity and undermines the ability of American democracy to engage in vigorous debate to address its pressing problems. The solution lies in new policies and institutions at the federal, state, and especially metropolitan level. We know what needs to be done. The main obstacle is the lack of political will to do it. 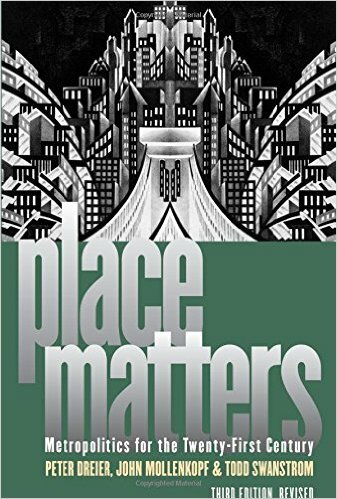 Contributors to the UAR series included J. Phillip Thompson (A Response to Place Matters), James DeFilippis (Place Matters, but maybe not in the ways they think it does…), Elizabeth Strom (How Place Matters: A View from the Sunbelt), and Todd Swanstrom (Reflections on Place Matters). With Place Maters in mind, the Forum asked Dr. Swanstrom to offer his thoughts on the recent events in Ferguson. His post follows this one.